Many apologies if my enthusiasm for your work has ever felt like being hit over the head! Fear no angry emails! I am trying to keep an up-to-date product list on my blog, and the amount of material available for DCC is incredibly vast and varied. I am a bit of an uber-nerd/fanboy about this stuff, and I own every product (if not every cover of every product) currently available, except the new holiday module, which I just haven’t gotten around to purchasing yet. Any of your listeners who are not snatching up each Companion as they become available is doing themselves a real disservice. 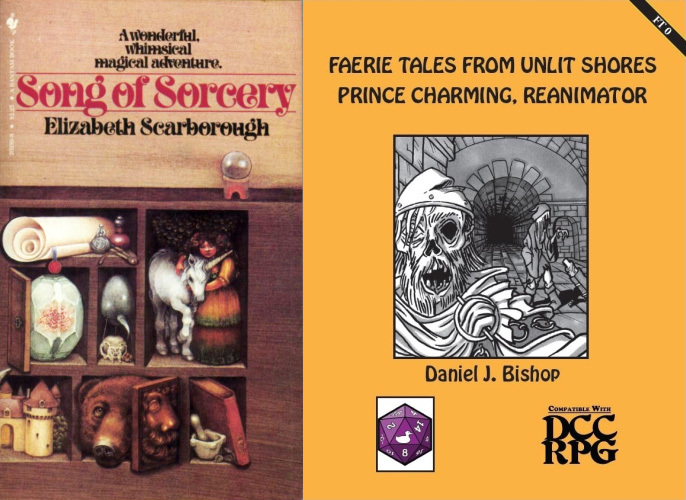 These are some very creative direct translations from fiction to the gaming table, and each one offers a wealth of gaming goodness! We appreciate your enthusiasm. I must say, creating content on such a regular schedule can be a bit tough, but it certainly is fun and I find it pretty rewarding. The response from the community, has been really nice especially since that is what we are all about, the community. Hopefully, as we roll into the next year, we will start building a calendar of events and conventions that folks can use to drum up more support for their efforts. In the meantime, keep putting out that great stuff! Thanks for the mention of The Trolls of Mistwood. I’m currently working on a second Mistwood adventure with Daniel J. Bishop that revolves around the hags. Hopefully it will see light of day the first half of this year. These podcasts are outstanding.